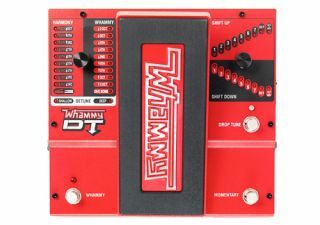 'We've taken the premier pitch shifting effects pedal and added drop tuning and true bypass to bring you the ultimate Whammy pedal, the Whammy DT. With the Whammy DT, you can modify your tuning without having to change guitars or pause awkwardly to make adjustments for the next song. Key changes are at the tips of your toes and take just moments, which is crucial when the audience is feeling your vibe. 'Pitch shifting effects really help your guitar performance stand out and the Whammy pedal has been the core pitch shifting effect for famous artists for over 20 years. Now with the Whammy DT you can add full drop and raised tuning in addition to classic Whammy shifting to your effects arsenal. 'The Whammy DT gives you the latest pitch shifting technology to retune your guitar without ever touching the tuning pegs. Step up or down in 7 half steps, or an entire octave with just one setting. 'With all the new tuning capabilities, you still have your true pitch shifting effects to sweeten up all moments of your gig. With over 20 years of leading the market in pitch shifting, Whammy effects give you the comfort of knowing the pedal you are using is a proven winner. Priced at £329 in the UK, we'll be reviewing the Whammy GT as soon as we can lay our hands on an example.